Since last year, when crude oil prices soared and gasoline topped $3 per gallon, requests for skimmers to be used for recycling oil from plant wash water, municipal wastewater, machine shop coolant, and contaminated groundwater have increased 25 percent according to one major supplier of oil skimming equipment. Usually, the generator pays for the oil to be disposed of, but an emerging trend is to sell the recovered oil to a recycler or burn the oil to lower heating bills. In the past, manufacturers have been motivated to clean oily wastewater either by regulatory compliance or by a desire to reduce disposal costs. Now industry is broadening its narrow focus on pollution control and cost reduction to include a realization of the profit hidden in its wastewater. Experts are looking at the increasing demand for oil in Asia and cautioning that prices could stabilize at $100 per barrel for crude oil, which ultimately translates into higher energy bills. According to a recent survey of plant and maintenance managers at manufacturing plants, machine shops, and other industrial facilities, more plant managers are considering recycling waste oil as a way to fight rising energy costs. The results show that 78 percent of respondents are struggling to find ways to reduce plant energy costs, and in the face of record-high fuel oil prices, 35 percent of respondents said they would consider burning waste oil to heat their plants. Now that President George W. Bush has called for new ways for Americans to reduce their addiction to oil, the findings suggest that companies could be doing more to reduce winter heating bills. Although 75 percent of the respondents said their companies skim oil from wastewater, only 8 percent said that their plants already burn waste oil for heat. Additionally, the survey uncovered a widely held misperception: 70 percent of respondents thought U.S Environmental Protection Agency (EPA) regulations for plants burning their own used oil were more stringent than regulations for waste oil disposal. In fact, the regulations are more relaxed. EPA supports the onsite burning of used oil because it prevents oil from entering the watershed and eliminates the risk of spills during transportation. Oil skimming uses the difference in specific gravity and surface tension between oil and water to pick up oil, grease, and other hydrocarbon liquids as a belt passes through the water. It is a cost-effective means of cleaning industrial wastewater prior to disposal or discharge. 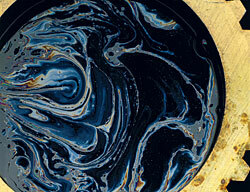 Oil skimming is the lowest-cost way to remove oil from water. Oil skimmers remove from one to 40 gallons of oil per hour, and when combined with an oil concentrator, water in the reclaimed oil can be reduced to as little as 1 percent. Burning waste oil is an environmentally sound alternative that prevents oil from entering the watershed, which is why EPA supports it. Technically the EPA term is "used oil" rather than "waste oil" (a term reserved for hazardous waste), but most people call it waste oil. Oil recycling is more common than people think. After it is collected, nearly 89 percent of used motor oil from vehicles is recycled for use as industrial fuel or for space heating. Because it usually has a thicker viscosity, used oil possesses more energy than #2 fuel oil. A typical gallon of waste oil contains 163,000 to 240,000 BTU -- more than twice the energy value of LP gas or coal. Of course, not all oil is collected for recycling, and waste oil finds its way into sewers, streams, and landfills. One quart of waste oil creates a two-acre slick on surface water, and a gallon of waste oil contaminates 1 million gallons of drinking water. Companies that skim their wastewater and recover their oil for burning or recycling are helping the environment at the same time they are reclaiming a valuable resource. Whether the reclaimed oil is to be burned for free heat or sold to a recycler, it is important to remove as much water as possible. For example, if a salvage firm wants to recycle the oil as a lubricant, then low water content eliminates a separate step and reduces refining costs. Under most operating conditions, a good oil skimmer will pick up oil with less than 5 percent water. But as surface oil is reduced to a thin layer (1/16 to 1/8 inch thick), more water or coolant may also be picked up along with the oil. When used in tandem with an oil skimmer, an oil concentrator will solve this problem by providing virtually complete oil/water separation. An oil concentrator (also called a decanter) is a secondary reservoir for the skimmed product that allows removal of water below the surface while oil flows off the top. Based on the principle of gravity separation, an oil concentrator uses no electricity, timers, sensors, pumps or other moving parts. Typically it is mounted on or near the skimmer and receives its discharged oil. For thicker-viscosity oils and low-temperature applications, a thermostatically controlled heater may be available as an option. Reclaimed oil flows from the oil concentrator into a 55-gallon drum or large storage tank. The 55-gallon drums are economical and easy to handle. If selling the oil to a recycler, the recycler will remove the drum and leave an empty drum in its place. If saving the oil to burn for heat in the winter, then many plant managers store the oil in 250-gallon polypropylene tanks, called totes, that can be moved with a tow. Waste oils that can be burned for heat include almost any oil up to 50 S.A.E. : metal cutting oils, lube oil, crankcase oil, transmission and hydraulic fluid, #1 and #2 diesel fuel, vegetable oils, and grease. After the oil is reclaimed from the wastewater, the facility needs a properly designed furnace, boiler, or heater to burn it for free heat. Several manufacturers and distributors may be found by searching online. Skimmed oil can be supplemented with used oil from other sources within an industrial plant or even from outside sources. Companies can accept free waste oil from other businesses that will be happy to avoid more costly means of disposal. Yet another source of waste oil is the recycler, who sells it for a fraction of the cost of fuel oil. Waste oil furnaces are engineered specifically to burn used oil, but most can burn standard fuel oil as well. Models range from small units used to heat automotive service garages to units that produce up to 500,000 BTUs per hour (the EPA limit without a special permit). A conventional furnace with a combustion chamber may be converted to a waste oil furnace, or a separate unit may be installed. In addition, waste oil boilers are used to supply hot water for radiant floor heating, greenhouses, truck and car washes, and industrial processes. The conversion/installation is relatively inexpensive, and it pays for itself in recovered energy savings. In addition, because burning waste oil for heat is considered recycling, the cost of the heater may qualify the company for tax credits. Contact your state EPA office for information. For burning waste oil, there are three main types of equipment. Which type is used for oil recovered from skimming depends on the particular situation and the amount of remaining trace water. Vaporizing-type heaters are small, simple, and inexpensive. Often there is no thermostat control. Atomizing heaters use compressed air and preheat the oil, providing more complete, cleaner combustion. combustion incineration system (CIS) heaters will burn oils that other heaters cannot, including ethylene glycol and non-flammable liquids like water. Oil skimmers help make oil recycling profitable because they offer a low initial cost, are easy to install, and operate reliably with minimal maintenance. Oil sticks to an oil-attracting medium and is removed as the medium is pulled through wiper blades or scrapers by a motorized drive system. The skimmed product is discharged through collection trays and drain channels into an external container. Belt, disk, drum, mop, and tube types each have their advantages, so consult the manufacturer for selection assistance. Also, the water collection system must be set up properly in order to get maximum performance from the skimmer. Because skimming requires the oil or other hydrocarbon to be floating, the water must be in a reservoir where separation can occur. The reservoir should have quiet areas and sufficient volume to allow adequate dwell time. This article originally appeared in the 10/01/2006 issue of Environmental Protection.